​ HIGH IN TRIAL (1st place overall). Placing 1st in containers and 2nd in Interiors and attaining their NW2 title. Teresa has been involved in many different activities with her dogs for more than thirty years as both a competitor and an instructor. 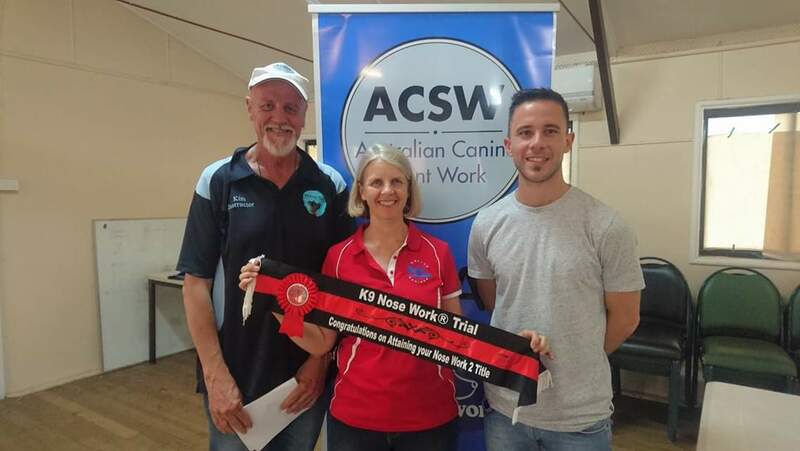 In that time she competed very successfully in the Conformation ring and in a number of different dog sports including Obedience, Rally-O, Tracking, Agility, ANKC Sheep and Duck herding and Three Sheep Trials. Most recently she has become involved in one of the newest dog sports, K9 Nose Work®. Teresa started K9 Nose Work® in 2015 with her youngest Border Collie, Elphie, when she was 18 mths old. She enjoyed it so much she also started her then ten year old recently retired agility dog, Max in 2015. ​In May 2017, Elphie passed her Odour Recognition Test (ORT) on Birch which is a prerequisite for entering a Nose Work 1 (NW1) trial. In August 2017,Elphie passed her ORT on Anise and Max passed his on Birch. ​On 27th August 2017 Elphie and Teresa entered their first K9 Nose Work® NW1 trial and passed all elements placing 4th overall to attain Elphie's NW1 title. They are looking forward to competing in a NW2 trial in the near future.